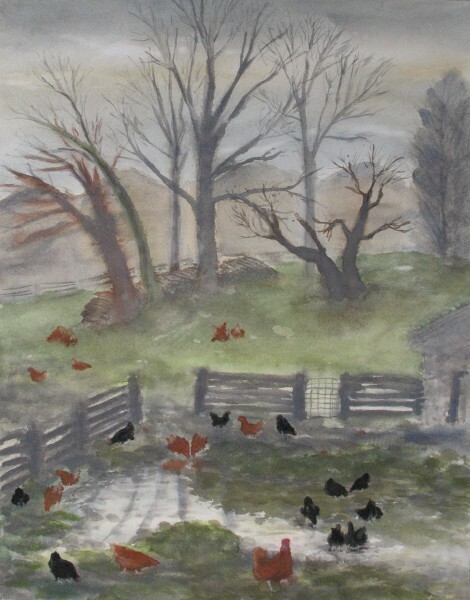 On November 23 and a few subsequent visits I garnered memories and sketches to paint the grey Ontario November skies and the yard where chickens scratch for food and splash in the creek running through the yard. In the background are included the beige townhouses that surround this pastoral for miles. In Doon (Kitchener) Ontario, on Tilt’s Drive is a chicken farm where you can buy eggs. 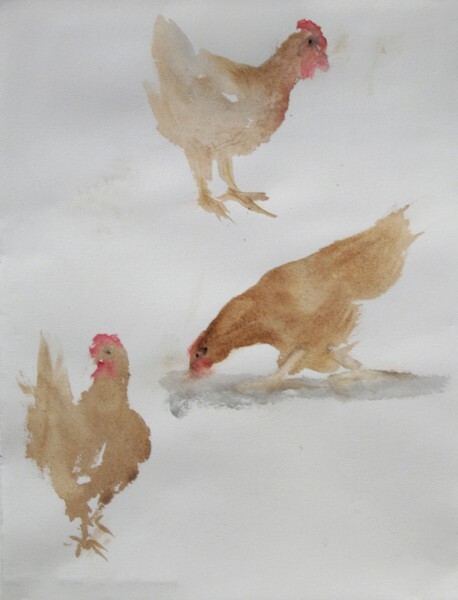 As I have not seen any cows in the landscape that I have walked so far, I decided to paint these chickens. The farm is across the street from Homer Watson’s birthplace. His family house is still there. In Tilt’s front yard is a maple that was planted in 1857. 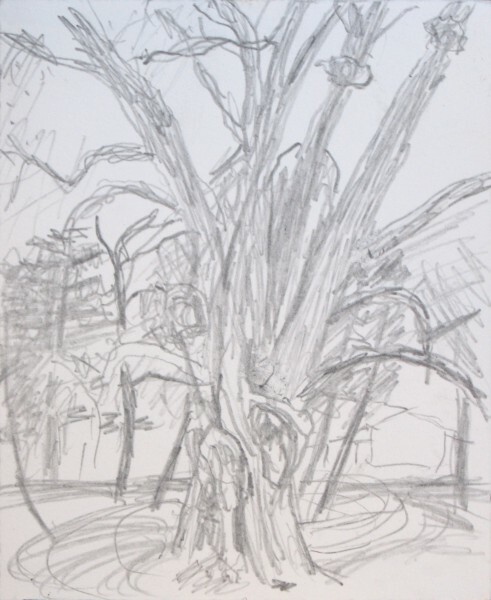 In this sketch you can see the maple and an outline of the house in the lower right. 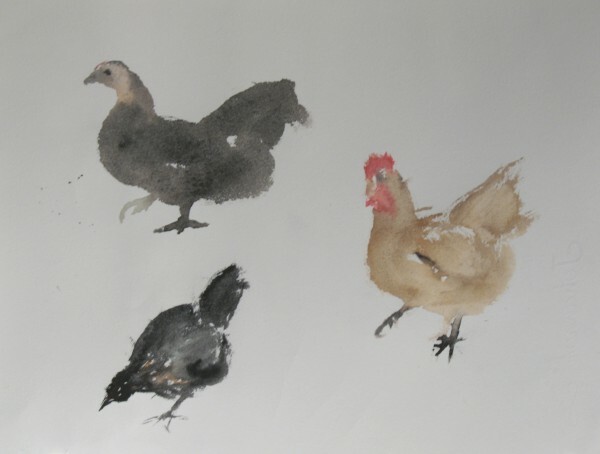 As a person under six years old I lived on a farm, where animals and chickens were in the barn and around the yard. Tilt’s farm brought back many memories of watching chicks grow up, walking around or through them and staying away from the roosters until they were soup. 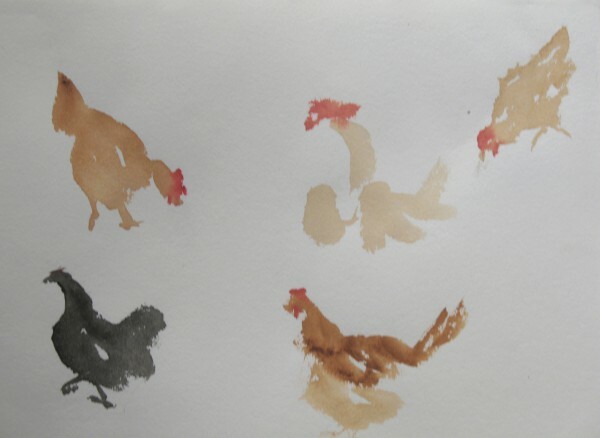 Tags: chickens, gouache painting, Homer Watson, Kitchener, maple, Tilt's farm, urban landscape | Permalink.